Recognition- The first and the most important thing before choosing a college is to check its authenticity whether the courses offered are recognized by AICTE or not. Due to rise in engineering courses and colleges most of them provide fake degrees so students must visit the UGC website and check their validation. Infrastructure- Before choosing a college do visit the campus check whether the college is equipped with modern labs and has basic amenities, get to know about the faculty who will be teaching you check their qualifications and teaching experience because your professors play a very important role. Placements- Day by day the competition is getting tougher the number of engineering aspirants are increasing thus decreasing the job opportunities this is something which most of the students are worried about in order to sustain yourself at the top position one must acquire the skills during his/her internship period grasp and learn as much as you can throughout your four years of college life the more you gain practical knowledge and develop required skills the more valuable you are. Practical Knowledge- In present scenario only bookish knowledge is not sufficient one must always learn how to use his theoretical knowledge into practical lives. Only theoretical knowledge will not take you anywhere in the professional life you need to have hands-on experience and required skills set in order to become the best in your field. Modern labs and equipment- engineering is possible only with the help of good labs and equipment. Unless the labs and equipment are up to date, a student will not be able to experience working on the latest machines or technology. Experience in labs while pursuing engineering courses is essential to learn how to put theory into practice. 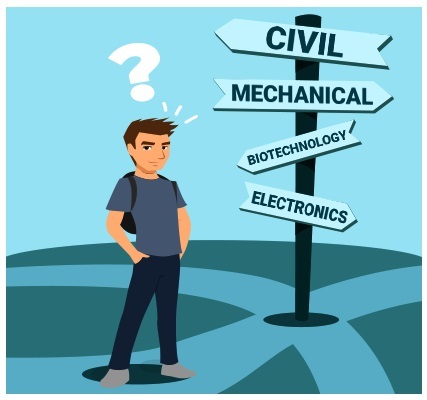 Career options- There are plenty of career opportunities after B.TECH students must be very clear with their goal, they must choose the branch which suits their interest they must not be in the confusing state so before pursuing B.TECH analyze yourself in which direction you want to go and work accordingly. Further study options- While pursuing engineering always make a plan for your next move and work towards it, if you are really looking forward to master your skills and knowledge in a specialized field then pursuing master in technical education is right for you or else if you are willing to get into professional life after B.TECH then your internship experience will play a crucial role and the skills which you developed at that time there are many other students who are passionate about becoming an entrepreneur hence they go for Master’s in business administration where they develop all sorts of management skills, leadership skills, communication skills and many more in order to become successful in the field of business.